Arsenal are 10 points behind leaders Leicester with six games to play. Mesut Ozil and Alexis Sanchez converted Alex Iwobi passes to put Arsenal 2-0 up but Carroll netted twice in 160 seconds to bring his side level by half-time. 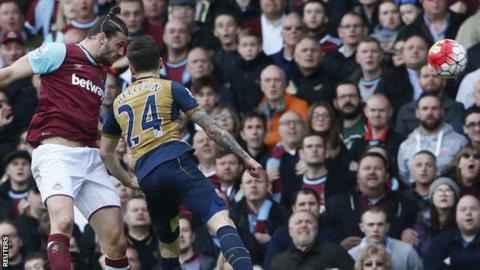 A far-post header completed Carroll's treble, before Laurent Koscielny hooked in the equaliser from 10 yards. The hosts extended their unbeaten home run in the Premier League to 14 games but Slaven Bilic's side remain sixth, two points behind fourth-placed Manchester City, who play West Bromwich Albion at 17:30 BST. Striker Carroll was rarely far from the action in a pulsating London derby, being booked as early as the fourth minute for a needless late tackle on Koscielny. There appeared little way back for West Ham as clinical finishes from Ozil and Sanchez gave the visitors a two-goal cushion, but England international Carroll would turn the game in his side's favour in the space of eight minutes either side of the interval. All three goals were typical Carroll efforts, the first a powerful far-post header from Aaron Cresswell's left-wing cross, while he was awarded too much space by the Arsenal defence to fire in the equaliser at the second attempt during first-half stoppage time. The ex-Newcastle forward was perhaps lucky to escape further punishment when he clashed with Gabriel in the air, catching the centre-back with his arm, shortly before rising above Hector Bellerin to head past David Ospina - who had kept his place in the Arsenal goal ahead of Petr Cech. Wins over Everton and Watford either side of the March international break kept any faint hopes of a title success alive for Arsene Wenger's side. Having led 2-0 after 35 minutes, this result will feel like two points dropped for Arsenal, even though they responded well to Carroll's quick hat-trick and were decent value for their draw. The Gunners have a favourable run-in, with five of their last six opponents currently in the bottom half of the table - but it will take a remarkable collapse from Leicester and Tottenham above them if they are to win an unlikely title. Saturday's result did little to improve Arsenal's record in London derbies this season - they have taken only six points from seven games against other clubs from the capital. West Ham manager Slaven Bilic: "I am so proud of my team to come back like that before half-time and then to be better than them in the second half. "Now Andy is fit and we hope he will stay fit. There aren't many players capable of doing what he is doing. "I'm proud of everything. We were spectacular. But the only thing I'm not happy about is the result." Arsenal manager Arsene Wenger: "We are third on 59 points and that's not where we want to be. "We have made it much more difficult to have a chance to win the championship but no matter, we have to keep going. "You never know what will happen, and we have clubs chasing us as well, so we have to be serious and focus on finishing as high as possible." Carroll's hat-trick was the fastest in the Premier League this season at seven minutes and 14 seconds. The Hammers are unbeaten in their past 14 home games (won seven, drawn seven) - the longest current run in the top flight. Alex Iwobi has scored twice and assisted another two goals in his first three league starts for Arsenal. This is the first time in the Premier League since November 2012 (v Fulham) that Arsenal have led by two goals and failed to win the match. That game also ended 3-3. West Ham switch their attentions to the FA Cup on Wednesday when they host Manchester United in a quarter-final replay, while their next Premier League fixture is at leaders Leicester four days later. Also on 17 April, Arsenal host Crystal Palace in another London derby. Match ends, West Ham United 3, Arsenal 3. Second Half ends, West Ham United 3, Arsenal 3. Attempt blocked. Manuel Lanzini (West Ham United) right footed shot from the right side of the box is blocked. Assisted by Emmanuel Emenike. Attempt missed. Dimitri Payet (West Ham United) right footed shot from outside the box is too high. Assisted by Mark Noble. Attempt blocked. Emmanuel Emenike (West Ham United) header from the centre of the box is blocked. Assisted by Michail Antonio. Attempt missed. Winston Reid (West Ham United) right footed shot from the right side of the six yard box is close, but misses to the right. Assisted by Andy Carroll following a corner. Attempt missed. Andy Carroll (West Ham United) header from the centre of the box misses to the right. Assisted by Dimitri Payet with a cross following a corner. Corner, West Ham United. Conceded by David Ospina. Attempt saved. Aaron Cresswell (West Ham United) left footed shot from outside the box is saved in the bottom right corner. Assisted by Manuel Lanzini. Attempt missed. Olivier Giroud (Arsenal) header from the centre of the box is close, but misses to the left. Assisted by Nacho Monreal with a cross. Attempt saved. Dimitri Payet (West Ham United) right footed shot from outside the box is saved in the bottom left corner. Gabriel Paulista (Arsenal) wins a free kick in the defensive half. Goal! West Ham United 3, Arsenal 3. Laurent Koscielny (Arsenal) right footed shot from the centre of the box to the top right corner. Assisted by Danny Welbeck following a corner. Attempt missed. Nacho Monreal (Arsenal) right footed shot from outside the box is too high. Assisted by Gabriel Paulista following a corner. Corner, Arsenal. Conceded by Winston Reid. Attempt blocked. Aaron Ramsey (Arsenal) right footed shot from a difficult angle on the right is blocked. Assisted by Mesut Özil. Dimitri Payet (West Ham United) wins a free kick on the right wing. Corner, West Ham United. Conceded by Nacho Monreal.